There is a certain attraction for budget phones, and Alcatel is a major player in that market. Today they have announced the POP 2, at only £99.95 to the UK market, which will be available from all Argos stores in the country. It also includes a Gecko Power Bank in the box, allowing users on the go charging. 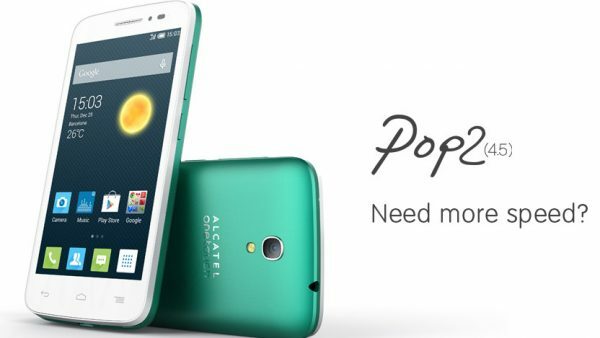 ALCATEL ONETOUCH today introduces the POP 2 (4.5) to the UK market. Initially unveiled at IFA in September the easy to use, 4G 4.5” smartphone runs on Android 4.4 and includes a 5 megapixel camera – all for just £99.95. Powered by Qualcomm’s quad-core 1.2 GHz Snapdragon™ 410 processor, the POP 2 (4.5) delivers fast streaming, browsing and multitasking. What’s more, the POP 2 is also equipped with advanced features like a download booster: using two network connections – 4G LTE and Wi-Fi — to enable a greater download speed. In addition, it offers useful features such as one-finger zoom, a mini-apps application that allows use of the phone’s applications without even launching them, plus a feature that reads QR codes, using the camera function, and Wi-Fi display, which lets users send images from their phone to a larger screen. The POP 2 (4.5) is available in White with a Gecko power bank included in the box, to provide on the go charging. The POP 2 (4.5) is available SIM free from argos.co.uk, the Argos apps for iOS and Android and from more than 700 Argos stores nationwide, priced at RRP £99.95.